Take the fuss out of serving food at functions with Banquetline by Victor. 70+ years experience in engineering food service equipment qualifies Victor to share valuable catering insights with you, our valued reader. Appreciating your time, we present our simple guide to help you make the right decision when purchasing your banqueting equipment. Banquetline gives you the ability to prepare and plate meals in advance of the required service time because our system holds bulk meals in optimal temperatures for both hot and cold foods over long periods of time. Introduced by chairman Leslie Graham in 1996 the Banquetline range has seen great success with many thousands sold across the UK and around the globe. Banquetline has supported food operations of all sizes from independent care homes to the UK’s biggest Banqueting sites. Having supplied in excess of 40 units to Olympic parks London stadium alone you can be sure we are equipt to deal with your banqueting needs regardless of scale. Flexibility. Banquetline gives you options to systemise large scale catering enabling more efficient staff productivity. There are six model sizes available from 44 to 216 plated meals per unit. Plates can be held stacked using plate covers or individually on shelves. Shelves and supports are removable and adjustable to multiple positions to suit your needs. Banquetline is also fully gastronorm compatible allowing food to be held in bulk. Heat Control. Traditionally, the more time that food is held hot, the more negative effects are brought to bare on taste and nutrition. 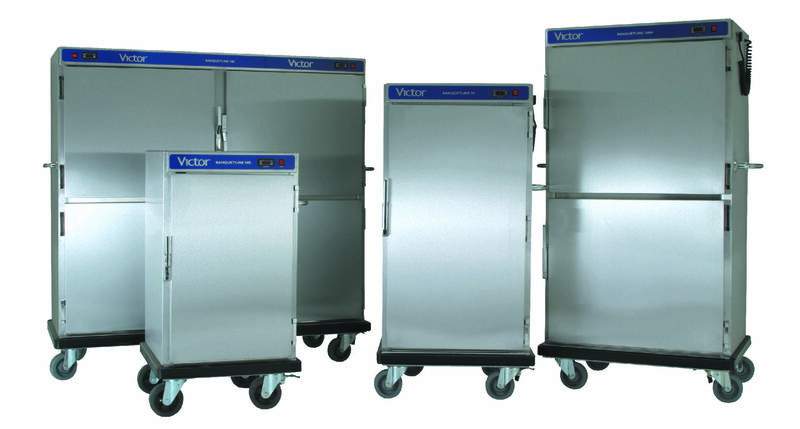 Our range of banquet carts allows you to keep the right temperature so that food can be held for much longer than usual whilst retaining the all important quality and health benefits. Cabinet temperature is easily adjustable between 65° and 95° using a simple temperature control. Hygiene. Easily removable internal parts with bright annealed stainless steel interior make cleaning fast and easy. Radius internal corners and minimal dirt traps give banquetline top marks for hygiene. Mobility. With 150mm castors, all round bumpers and heavy duty push bars, Banquetline enables your food to be transported smoothly and safely from kitchen to dining area. All units operate with a 13 amp heating system making movement hassle free and safe. Food presentation. Allow for the ideal plating presentation by taking advantage of the Banquetline long hold feature. Food can be prepared to look great in advance whilst still maintaining optimal heat, condition and speed when waiters are serving your dishes. Cost Effective. Serve meals without needing specialized waiters to plate food at the table or many chefs to plate up dishes all at once which saves you time and money. Also, many competitive brands are imported and subject to the current high price of the US Dollar. Our prices are fixed until 31 December 2017. Humidity. Highly moist foods hold best when covered and kept humid. Optional humidity is provided via the integral water reservoir in the cabinet base so that you can keep your foods in great condition. Place your order or inquiry.